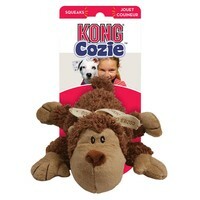 Kong Cozie Naturals Dog Toy is an amazingly cute and cuddly plush toy that your dog simply won't be able to leave alone. Made from extra tough material with an extra layer for added strength and durability, these luxuriously soft and fun toys come in 3 cute random variations. Brilliant for games of fetch or even for just a cuddle toy for your pet to snuggle beside, these Cozie Naturals will be adored by your dog! Please Note: These toys come in a variety of designs that cannot be chosen or guaranteed.